What is a 2255 motion? The long form of the title of the motion is, “Motion Under 28 U.S.C. § 2255 to Vacate, Set Aside, or Correct Sentence by a Person in Federal Custody.” It is commonly referred to as a “collateral attack on the judgment,” as opposed to a direct appeal, which is a “direct attack on the judgment.” It is a type of post-conviction motion. 28 U.S.C. § 2255 and § 2241 make up the old habeas corpus law. What is a 2255 motion used for? (1) Ineffective assistance of counsel at the plea, trial, sentencing, and/or appeal levels. If an attorney representing the defendant was “ineffective” within the legal meaning of that word, then it must be complained of in a 2255 motion. (2) Prosecutorial misconduct. If the U.S. Attorney’s office or an agent of the Government committed “misconduct” within the legal meaning of that word, and that affected the Defendant’s substantial rights and, except for that conduct, there would have been a different result in the case, then it must be raised in a 2255 motion. (3) Newly discovered evidence. If, after sentencing, there is new evidence discovered that could not have been discovered before the sentencing, you may raise that in a 2255 motion. (4) A substantive change to the law that has been explicitly made retroactive by the U.S. Supreme Court. When can a 2255 motion be filed? (2) New evidence is discovered that could not have been discovered before. (3) The date that the Supreme Court first declares that someone in your situation has a right that affects your sentence or conviction (but only if the Supreme Court specifically makes it retroactive). (4) The date of some government action that prevented you from filing before. (Sometimes the Government’s explicit denial of a Rule 35(b) motion can restart the 12-month period. If you think this happened, definitely have an attorney advise you because arguing this issue is very technical and depends heavily on the circumstances of the particular case). Once a 2255 motion has been filed, what happens? The motion will be filed in the same Court in which you were sentenced. If the same Judge is there, then that Judge will normally be the one to rule on your motion. There are several potential outcomes. First, the Judge, once he or she receives the 2255 motion, may just deny the motion. 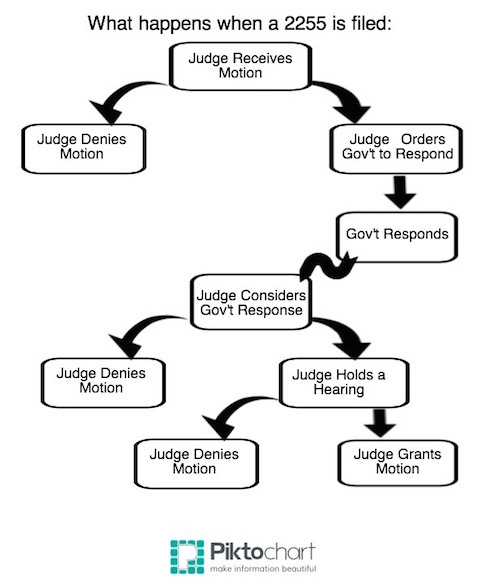 Second, the Judge may order the Government to respond to your motion, and then, after the Government responds, deny the motion. Third, the Judge may order the Government to respond and then, after reviewing its response, grant a hearing at which you and the Government will be allowed to offer evidence. At that point, the Judge may grant or deny the motion. If it is denied, you may appeal to your circuit’s Court of Appeals, but only if you meet certain technical and substantive criteria. What is a 2241 motion? A 2241 motion is a mechanism whereby one can complain of being unlawfully detained for any number of reasons recognized by law. A typical case is an improper calculation of sentence credits leaving a defendant to serve more time in prison than is proper. Another would be a claim of actual innocence that cannot be brought anywhere else for any number of reasons. Another would be some issue that has been unsuccessfully addressed through the Bureau of Prisons’ Administrative Remedies Program, after Administrative Remedies have been exhausted (meaning after the BP-9, BP-10, and BP-11 forms have been filed and denied). Sometimes “cruel and unusual punishment” claims can be made in a 2241 motion. In many cases there is no technical deadline to file a 2241, but often certain “conditions precedent” to filing have to have occurred, otherwise your motion will be denied for “failure to exhaust remedies.” There are many other considerations and variations that an experienced attorney can guide a defendant through. What if I signed a Plea Agreement in which I waived my right to appeal and to file a 2255 motion? Many issues that could be raised in 2255 motions can be waived by signing a plea agreement that says the defendant is giving up his or her right to appeal or file any other post-conviction motion. HOWEVER, an otherwise valid appeal waiver will NEVER waive the right to appeal ineffective assistance of counsel or prosecutorial misconduct “that rises to a constitutional dimension.” This is a high standard, but if you believe ineffective assistance of counsel or prosecutorial misconduct of that level are involved in the case, it is worthwhile to have an experienced attorney review the case and advise you. If, for one of the reasons listed above, you feel you or a loved one has been wrongfully convicted or sentenced, call us today! A clock is running on the deadline to file, and an attorney’s help is often necessary just to calculate the deadline. 2255 and 2241 motions are very technical, and most should only be done with the help of an experienced attorney. An attorney should, at a minimum, review the case to see whether the motion is worth filing at all and to identify the best issues to include in the motion. My office conducts reviews to see if the 2255 motion is worth filing and identify the issues that would give you the best chance of success for $8,500.00. (The review for 2241 motions costs considerably less.) For this fee, you will learn whether a 2255 motion will help you and get a sense of its likelihood of success. Additionally, at the completion of the review, we will be able to quote a precise fee for representing the defendant in filing this motion. If you are eligible, you may be able to get a hearing in a year. If you are not eligible, then you will be free from the worry that you should pursue it further. Please call me at (512) 693-9LAW or email me with questions or for more information. To email me, just click on the “Contact Us” link here or at the top of the page, and I would be glad to talk to you.